Made this for the family last night and it was delicious. Everyone loved it. The meat was moist and flavorful. Thank you!! A big hit! I will agree a little more work than many of the other recipes here. I read comments before starting and cut the tomato paste by half…gravy was perfect.The funny thing about this dinner is that I was including my 2 & 7 year old grandsons who were visiting. My son said the youngest is getting into a picky food phase. He woofed it down! Thanks for the delicious recipe. We loved this recipe. So much flavor in the steak and the gravy. I used baby Bella’s mushrooms and they were fantastic. Delicious and easy to make. I did add some beef base to the gravy because it had a tomato taste. I will definitely make this again but I will use less tomato paste or eliminate it completely. My husband enjoyed it as well which says a lot. This is one of Gina’s older recipes, but I’ve made it twice now. This is total comfort food…soooooo good…….and it’s healthy! Makes me happy. Thank you, Gina! Total yumminess. ???? Wow! Best Salisbury steak I’ve ever made. Just yummy. Question!! Need help, making meals for elderly parents. Can I just cook slightly and put in freezer for later meal? LOVE this recipe! I add garlic because I add it to everything. I also double the sauce because it is so amazing! Thanks for another great recipe! Delicious but I’d love to know what the Saturated Fat Content is – it’s not listed. Thanks. Yummy!!!!! Even my picky 5 year old and 13 month old loved it. Made it 3 times now and it’s a hit every time. Insread of serving this with mashed potatoes…I served cauliflower rice excillent and cuts the carbs some. This is so DELCIOUS! I’ve made it a few times now and don’t deviate at all from the recipe. My husband thinks its magical. LOL The recipe makes enough for us to have 2 dinners. I freeze the leftovers with gravy flat in a Ziploc, then thaw and reheat stovetop with a lid. I always pair it with the Instant Pot mashed potatoes from this site and steamed asparagus. Another WIN in my house, thanks Gina! Side note – this is a definite weekend only dinner since there are too many steps for a busy weeknight, but the level of deliciousness and the fact that we get 2 meals out of it makes it totally worth it! Thank you — that’s a really good tip to know! Loved this! Several steps but it was easy, tasty and very filling! Bravo! Amazing! My kids gobbled these up, mushrooms and all. Made this tonight served with cauliflower purée. It was fabulous.. Will definitely add this to our meal rotation! I made this tonight and it was super good! I only cooked 2 of the steaks and will freeze the rest along with some of the gravy for future use! I will definitely make this again!! 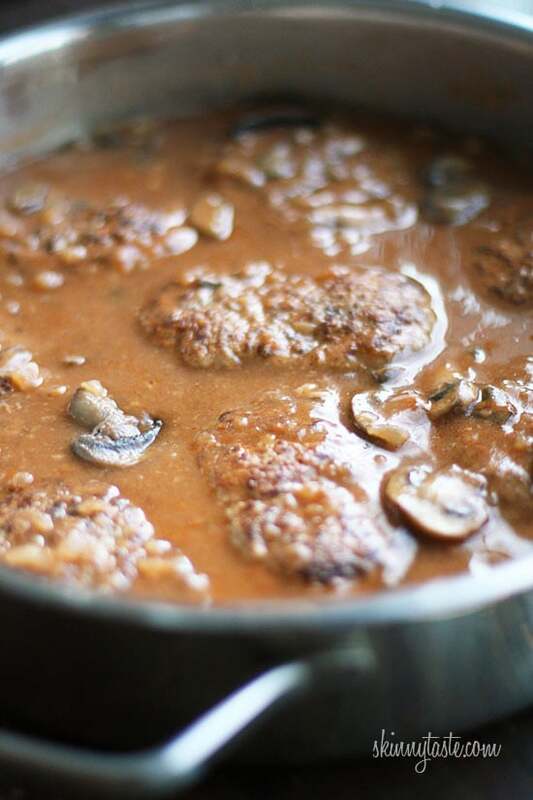 I made salisbury steak quite frequently with canned soup. Since going gluten free that has not been possible. I am so glad that I could find a lighter version that could be adapted to a gluten free meal. It is just the 2 of us so we ate 2 of the patties with mashed potatoes and a steamed vegetable blend, 2 are in the fridge for leftovers and I have 2 meals in the freezer. Healthy doesn’t mean tasteless. Thanks for another great recipe. after a busy day with Mashed Potatoes and Peas. The Gravy is so delicious! Took longer in oven…. but Soooooooo good!!!!! I’ll have to buy a bigger pan!!!! What size do you use?! Making this right now…. can’t fit it all in a pan!!! What size pan do you use?! Putting it in the oven??? ?hope it works! I added finely chopped mushrooms and 1 finely chopped carrot to the onions and sautéed them together and added this to the meat mixture. This adds more flavor, taste, and texture-moisture to the meat! We had this tonight. Everyone loved it.! 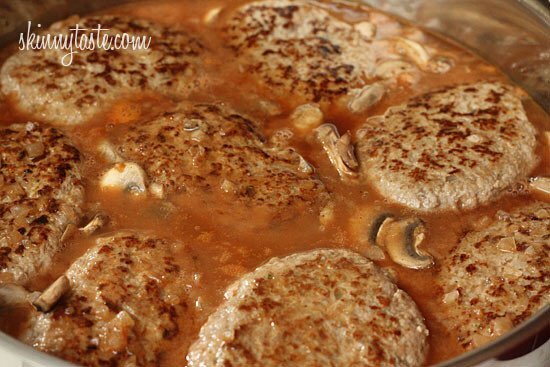 This is an awesome recipe to make Salisbury steak so much healthier! Love Skinnytaste! Meant to mark this as five stars! How would I make this in the Instant Pot? I’m new to pressure cooking so is that even possible? This dish was delicious! My husband loved it and couldn’t believe it was half made with Turkey. Thanks for sharing. I made this for dinner tonight and boy it was good. 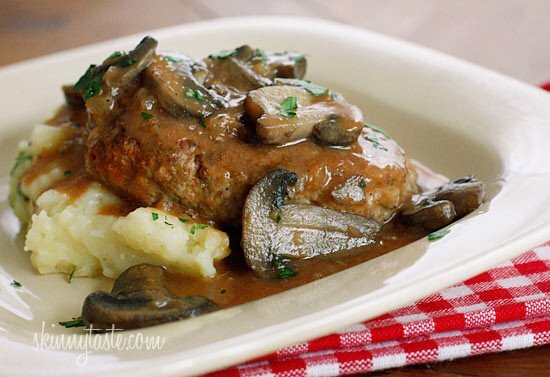 I loved Salisbury Steak TV dinners as a kid. I never expected to be able to duplicate it homemade. The steak was tender. I expected it to be tough with the lean beef and turkey, but it had that Salisbury tenderness. For sure going to make this again. I have been making a lot of low carb dishes from Skinnytaste – mostly Chicken and all have been delicious. Wanted to change things up with ground beef. This dish was a hit! A “keeper” according to my husband! Thank you! Delicious recipe, but I think your history on this is incorrect. Salisbury steak is from the civil war era. Made this last night and we both really liked it. I also liked that there was enough leftover to freeze. This is just the second recipe of yours I’ve tried and we liked both. I like that I’m making from scratch but it’s not terribly time consuming. I will definitely be trying more recipes. 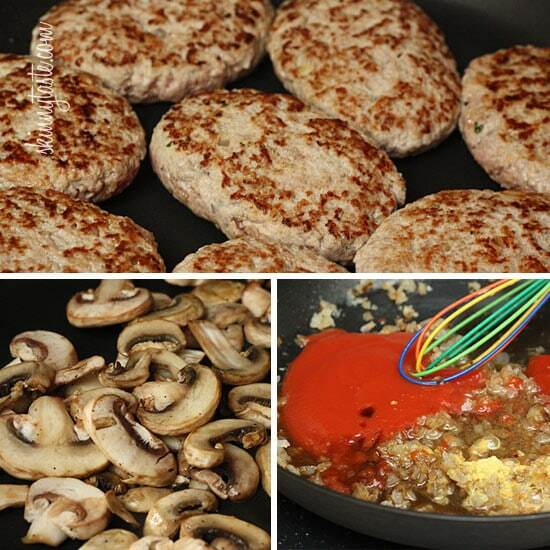 When you brown pattys or heat the mushrooms, do you use oil? I used low fat ground beef for the patties,otherwise made them as written’with 2 egg whites.There is just the two of us,so had 2 meals of patties & the rest were meatballs & frozen. 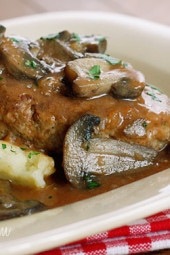 Gravy d…….idn’t use tomatoe or mustard, added a tsp of wine vinegar.Upped the amount of mushrooms,Worcestershire & a tsp of beef base.Used 2 tsps corn starch in a bit of cool water to thicken.I like to simmer,then leave to rest in the gravy for 15 minutes.Thank you Gina,another winner. These are amazing!! My husband said they are better than you would get at a restaurant!!! Loved it and so did my husband. Used 2 lbs 90/10 beef, added GravyMaster to correct the sauce color the other reviewers mentioned, a bit more salt and about a TBL of cornstarch mixed with a bit of beef stock to thicken the gravy at the end. Thank you Gina!! Got your cookbook as a gift and am really enjoying it! OMG! This was awesome! And leftovers! Yummy!!!!!!! Made it with Venison. Excellent!!! I made this tonight! I enjoyed it! I love the gravy too! Do you think that I could use almond flour (or something else in place of breadcrumbs) to make this whole30 compliant? I love this recipe but I don’t like that the sauce comes out more red in color and sharp tomato flavor than a traditional Salsbury brown gravy. I think too much tomato paste is used, I’ll half the tomato paste next time, if anyone has tips for a brown gravy that’s more like Salsbury steak gravy that would be a big help. Still love 95% of skinnytaste recipes! With all the ingredients I was expecting a well seasoned dish. Followed it to a T, but needed to add way too much salt at the table than I would like. One of the few of Ginas receipes that I would not serve again. It was blah. Sorry…. Thank you again for another delicious family style recipe. Both of my kids (age 3 & 16 months) loved it along with myself and m husband. We live your healthy and delicious recipes!!! This is a great Comfort meal, I just received your cookbook in the mail today, and I love it! What a treasure. I went from 230 to 160 pounds eating your recipes, and I feel great. I made this tonight and it was fantastic! My "meat and potatoes" husband loved it! I don't have a large skillet, so I used a roaster and baked the steaks with the gravy for 30 minutes in the oven at 350. Delicious! My husband and 9 yr old son loved it which is AMAZING. The only change was ketchup for tomato paste because I was out. This is definitely a keeper. I just made this recipe tonight. Craving comfort food and this was absolutely delicious. 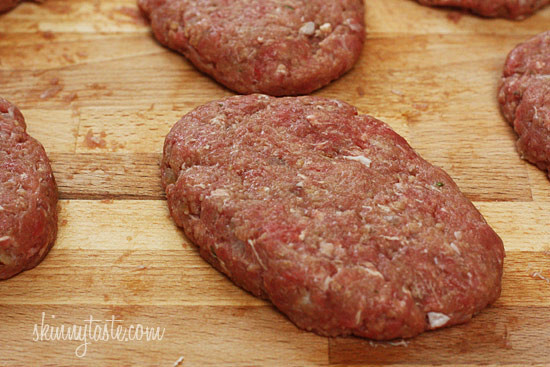 I have never tried combining ground beef and turkey, but the result was excellent – the patties are moist and flavorful. I served this with Skinnytaste cauliflower puree which proved to be just as good as mashed potatoes. BTW, I used sliced shiitakes since the white button mushrooms at the grocery looked pathetic and they turned out great. Thanks for an excellent and creative recipe. I made the Salisbury steaks last night and they were sooooooooooooooooo good. I absolutely love your recipes. You are amazing, Gina. Wow! Wow! Wow! Got your cook book last week and I love it! I found this recipe in there and made it tonight for an early dinner. It was awesome. Served it with roasted butternut squash, little potatoes and steamed brocoli. The best part is I also have 3 more meals for other days. Thank you for another delicious recipe. Yummy!! The second time I made this I didn't feel like making the patties…..so I made the gravy and added browned ground beef and served with egg noodles with fresh green beans on the side. THanks for the awesome recipe!!! Most Excellent! Made this with all lean ground sirloin (96% lean) and used a pound of baby bella's rather than 8 oz. LOVED by all! Even got my two picky mushroom haters to eat their mushrooms tonight! Served this over the skinny garlic mashed potatoes (which my 7 year old requests weekly) and a side of lemon garlic broccoli. OUTSTANDING dinner. Thank you again Gina! Gina–I found your website a few years ago and this is my "go to" for all recipes. When I see something that is typically calorie laden I think to myself, "I wonder if Gina/Skinnytaste has a recipe for that?" This recipe is no exception. I am the only person in my house that likes mushrooms but this recipe was a hit last night! The kids and my husband licked their plates clean and even went back for seconds! You are amazing and I can't wait for your cookbook! Hooray! Another delish recipe – thank you Gina! I knew I would like it. My son and husband did too – so, bonus! Stuck to recipe with just one exception – I had a 1.5 lbs of 85/15 ground beef, so I just used that, made 6 patties, and upped the points a few. The gravy/sauce really makes it. We had this for dinner tonight and it was delicious! It tasted like the frozen meal only better. We love your recipes. Keep up the amazing work! This was sooo good. I did modify it a bit, and doubled the mushrooms, left the broth out of the patties but used it in the gravy and used vegetable broth instead of beef as it's what I had on hand. I made mashed cauliflower to serve it over and a side of asparagus. It was great. I did add a bit of salt to the patties and the gravy as well. Delicious. Served this with your Garlic Mashed Potatoes. Yum! Did halve the meat portion since it's just my husband and myself. Enjoyed it. Had to control myself, as I wanted to eat more than a serving. But I have a lunch for next week. Gina, Can I use all lean beef on this? The Hubs will not eat any fowl (which makes my cooking challenging)… have tried many recipes off of this site and they have all been amazing!! ok, I guess I'm the one…made this tonight..was not very good. 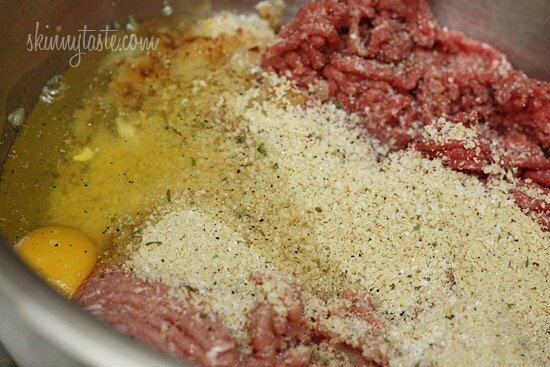 Halved the recipe – grass fed ground sirloin and organic turkey. portabello mushrooms I left at 8 oz and added a litle extra beef broth when I sauteed them, but all the other ingredients I halved. Got a good 'brown' on the meat patties in my dutch oven and also on the onions – did them in a 10" stainless skillet so they would cook and not steam. suggestions? my teenage son – greatest audience for a cook there ever was..was kind but luke warm. it just didn't have much flavor…like…none. Another great recipe! I left out the mustard powder because we don't like it, but it definitely didn't taste like anything was missing. Even my husband thought this was a really filling, hearty meal. Delicious, will make it again! I made this last night. It was very good!! The only thing I may try different next time is many less or no water at all. The gravy the runny. Other wise pores with the delicious skinny garlic mashed potatoes, my AND the man of the house loved it. If I can sneak skinny recipes past him they must be worth keeping. The main problem with the recipe (served with pureed cauliflower) was that we needed to double everything. Two little boys eat more in one sitting than we eat in two! Thanks for the great and health recipes that little boys love! My husband, who never wants leftovers, ate this again the next night. I have been doing Weight Watchers for 4 months and it is so nice to have the points values for all the recipes. Again another great receipe. This is one of my go to's in the freezer. I always make a double recipe of this and vacuum seal and freeze in a 2 serving size. Putting this on the table for dinner tonight! I already had a sneak taste….DELICIOUS!!!! Hi, I was just wondering if you could freeze half of this? I was looking at the ingredients and it looks like it would be kind of hard to half the stuff for the meat mixture but it's just me and my boyfriend so 8 servings for 2 people is kind of a lot! I didnt know if I could make the meat mixture and then freeze half of it for a later use. I always make a whole recipe’s worth but freeze half of the patties and gravy for another meal. Works out great for my family of three. And it makes a super easy meal for the second night—just thaw, then heat and eat! I also add a whole teaspoon of mustard powder. It was an accident the last time I made this, but we liked it better! You are cooking and then freezing, right? Or freezing raw patties? We just made this and LOVED it! Modified for things I can get easily here in Peru. Husband-approved! I made this tonight, but after mixing all the meat, I knew the patties would be huge so I used my large #25 scoop and ended up with 11 patties total. Served with mashed potatoes this was a very filling and delicious meal with plenty of leftovers for lunches for the week too. We are trying to make the meat more of a side dish in our house and put more emphasis on the veggies so the smaller portion worked out great for us. 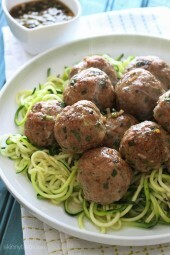 Just thinking how great this would be as meatballs for an appetizer too! Thanks for another yummy dinner! Made this tonight. Completely edible but the meat really didn't have a lot of flavor. The gravy did, but not the meat itself. Completely fixable, though! Filling and mostly satisfying for 5 WW+ points. Made this last night & it was amazing!!! 🙂 My sauce turned out a reddish color too, but was so good. Next time I might add a dash more Worstershire….just a personal preference. Definitely a keeper recipe!! Very good!! made with all turkey. 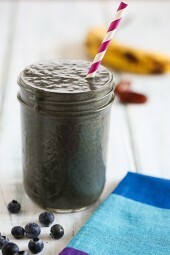 Glad to find a "good" recipe that is Weight Watcher friendly! I made this and it was amazing!!!!!!! I didn't have Worcestershire or whatever so I used beef base. It looked just like the picture and tasted better than I expected. I would love to make this but my son is allergic to eggs. I assume they are just being used as a binder. Do you think the patties would hold together without the eggs? I know this was a long time ago you posted this, but for those allergic to eggs you can soak one tablespoon of ground flaxseed in 3 tablespoons of hot water to replace one egg. The serving size says 1 pattie. Is there something I can use instead of eggs? My husband is allergic. I made this for dinner tonight and it was a hit! Easy and quick and delicious! I don't have any memories of salisbury steak having tomato paste in it so I think I might leave it out next time just for memories sake. Thanks for the recipe and I love your site! 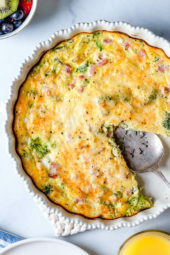 I wanted to make this for dinner tonight but realized we have only one egg left! Is it possible to use only one? Can i replace it with oil or something? were in the middle of storm nemo or I would run to the store!!! Fantastic! I made this with bison meat instead of beef/turkey mix. Served with mashed potato/cauliflower (one potato +1/2 head cauliflower w/FF 1/2 & 1/2) and sugar snap peas. I caught my 13-year old eating the last patty from the pan when he was supposed to be doing dishes. Neither he or boyfriend-in-law realized they were eating healthy. This was so delicious! And so easy! My husband loved it and wants it for the 2nd time in a week! We have been trying all your recipes and I have yet to make one that the whole family hasn't enjoyed. Thank you for all that you do! Love this one. Very easy and the taste is out of this world.